If the proposed Keystone pipeline expansion gets built, oil will flow from Canada to the Gulf of Mexico. But will it stay in the United States, or get shipped elsewhere? Supporters of Keystone say the project will benefit Americans because it will reduce the country's reliance on foreign oil. But critics claim the oil Keystone carries will simply be exported to other parts of the world. Which argument is right? Refining analysts say both. It's true that the 830,000 barrels a day the pipeline is slated to carry would probably replace some of the 2 million barrels a day of heavy oil currently imported to the Gulf Coast. It's generally cheaper to transport oil by pipeline than by ship, so refiners would likely opt for the Canadian crude. "They want the additional Canadian barrels to displace higher cost barrels from Venezuela, Mexico or Saudi Arabia," said Allen Good, an oil company stock analyst at Morningstar. The energy boom in both the United States and Canada is already reducing imports. In 2008 the United States imported 9.8 million barrels of oil a day, according to the Energy Information Administration. By 2012 that number had fallen to 8.5 million barrels a day. But it's also true that exports of refined products from the United States will likely continue to rise. Thanks largely to better fuel economy and higher prices, the long-term demand for gasoline in the United States is either flat or declining. That means the nation's refineries are producing more gasoline, diesel fuel and other oil products than the country needs, and exporting the rest. Gasoline is actually one of the nation's largest exports, going mostly to Latin America. In 2008 the country exported 1.8 million barrels a day of refined products, according to EIA. By 2012 that number jumped to 3.2 million barrels. Once refined, it'll be impossible to tell exactly where the oil that came down the pipeline went, but "with more oil, that [export] number will increase," said Milne. 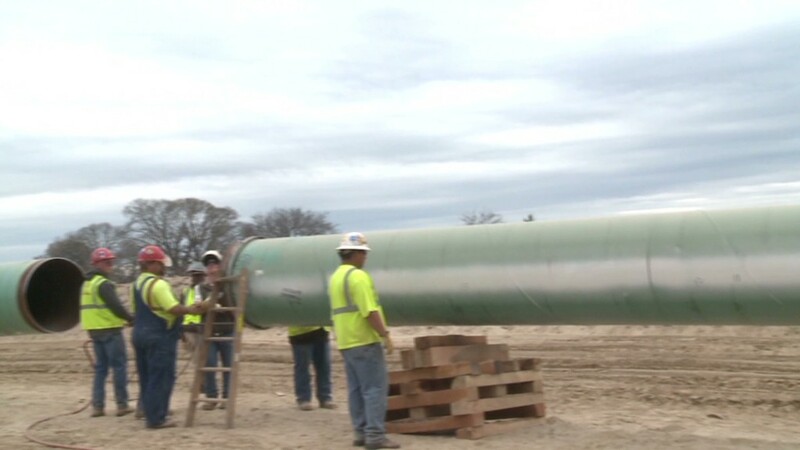 President Obama is expected to either approve or deny the pipeline by the end of this year. The project has become a matter of intense debate in the United States. Critics hate it because they fear it will accelerate "dirty" oil production from Canada's oil sands region in Alberta. Oil sands crude emits about 17% more greenhouse gases than traditional oil, according to the U.S. State Department, largely due to the heat it takes to separate the oil from the sand. Supporters say the oil is no dirtier than other forms of heavy oil the country is currently importing.